Manny Ballestero is an honest hardworking musician at New York's Stork Club. When his wife needs money for dental treatment, Manny goes to the local insurance office to borrow on her policy. Employees at the office mistake him for a hold-up man who robbed them the year before and the police are called. The film tells the true story of what happened to Manny and his family. Does the fact a movie’s based on a true story somehow make it special? Apparently the creators of 1956’s The Wrong Man thought so. The flick opens with a prologue from director Alfred Hitchcock in which he stresses the reality behind the tale and its uniqueness in his canon to date. Man starts on January 14, 1953, as we meet Manny Balestrero (Henry Fonda), the bass player in the house band at New York’s Stork Club. His job keeps him out late, and he returns home to his wife Rose (Vera Miles) and sons Greg (Robert Essen) and Robert (Kippy Campbell). Rose needs money to fix some dental problems. Since they’re short on cash, Manny goes to their insurance agency to borrow the bucks on Rose’s policy. Problems ensue because all of the employees at the agency believe Manny’s the guy who robbed Ann James (Doreen Lang) a few months earlier. Eventually the police take Manny into custody and grill him about this crime as well as some others. As part of the procedure, they ask Manny to copy the crook’s note. Things look bad when his handwriting resembles what the cops see on the original document. James and other witnesses again identify Manny as the robber, so the police formally arrest him. Eventually he gets out on bail and takes on Frank O’Connor (Anthony Quayle) as his lawyer. The rest of the film follows Manny’s attempts to prove his own innocence as well as the effect the whole ordeal has on his family. That last element plays a surprisingly large role in The Wrong Man. Does it count as a spoiler to reveal that Manny isn’t the robber? That seems obvious given the film’s title, although the movie doesn’t make his innocence explicit until the end. Nonetheless, the story revolves around our general acceptance of his guiltlessness, so I don’t think it gives away too much to indicate that Manny really is “the wrong man”. The flick offers an odd mish-mash of story elements. As I mentioned, we see a lot about the impact Manny’s experiences have on his well-being and that of his loved ones. Actually, I should qualify that to refer to loved one, as we don’t see many effects felt by Manny’s kids or others. Instead, the film focuses on how Rose adapts; I won’t give away those details, but let’s just say she handles things really poorly. In addition to those elements, Man looks at the criminal justice system through Manny’s eyes. It creates a nicely dark feel for all its different aspects, and that works for the film. We’ve seen all the routine police procedures a million times in various movies and TV shows, but Man allows us to understand just how scary it all would be for a neophyte, especially someone who did nothing wrong. So there’s two story threads: Manny’s experiences in the legal system and the way his affairs affect his family and himself. That should be enough for a movie, but Man just keeps going. We also have to follow his attempts to clear his name, so this leads into detective elements. Manny tries to track down various alibis but invariably finds dead ends, and that creates a major arc. On paper, I suppose these various components don’t sound like too much to pack into a nearly two-hour movie, but in reality, they come across as excessive. Perhaps the problem stems from the way that Hitchcock integrates the pieces. The film never establishes a steady tone, as it comes from family drama to film noir to mushy melodrama to psychodrama. It flits about in search of consistency that never comes, and this makes it somewhat jerky. When Man succeeds, however, it works pretty well. It fares best in its first act, as it draws us into Manny’s tale. A nicely even-tempered performance from Fonda helps. He makes Manny real and avoids showy clichés. Instead, he comes across just as straight and bland as he should. Unfortunately, as the movie progresses, it starts to collapse under the weight of its various story threads. They pile onto each other so awkwardly that they destroy the simplicity that allowed the film’s early segments to prosper. I also could live without the flick’s sappy ending. 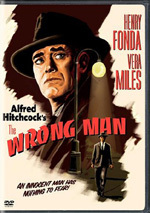 The Wrong Man displays a surprising lack of cynicism for a Hitchcock movie, and I don’t intend that as a compliment. Perhaps it’s refreshing to see something a little different from the director, but I don’t think the film’s innocence works for it, and a harder edge might have made it more memorable. 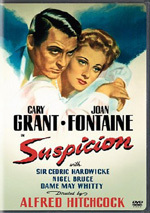 The Wrong Man appears in an aspect ratio of approximately 1.85:1 on this single-sided, double-layered DVD; the image has been enhanced for 16X9 televisions. Man remained watchable but suffered from a mix of concerns. Sharpness usually wasn’t one of those problems, though. At times, the image looked slightly soft, especially in wider elements. Otherwise the movie offered good definition and clarity. No issues with jagged edges or shimmering occur, but some light edge enhancement was apparent. Source flaws were the biggest distraction. The movie looked awfully grainy at times, and a mix of other issues cropped up through the movie. I saw various examples of specks, blotches, grit, nicks, streaks and marks. Blacks looked quite good, though, and shadows were nicely delineated. The film showed a nice silver tone for the black and white image, and contrast was solid. This was a fairly average transfer overall. The monaural soundtrack of The Wrong Man was perfectly serviceable for a 50-year-old flick. Speech demonstrated a little brittleness, but the lines were acceptably natural and distinctive, and they lacked edginess or issues with intelligibility. Effects seemed slightly metallic as one might expect of older material. They remained reasonably crisp and accurate, though. Music followed suit but scored some points for its surprisingly strong sense of low-end. Bass was response was much livelier than usual - maybe a little too lively. The bass wasn’t overwhelming, and it usually sounded good; the score simply was a little too low-end heavy at times. Nonetheless, this was a pretty positive mix. When we look at the DVD’s extras, we get the film’s trailer as well as a new documentary called Guilt Trip: Hitchcock and The Wrong Man. In this 20-minute and 15-second piece, we see movie clips, archival materials, and interviews with filmmaker Peter Bogdanovich, film historians Robert Osborne and Richard Schickel, art director Paul Sylbert, Bernard Herrmann Estate manager Christopher Husted and Psycho II director Richard Franklin. 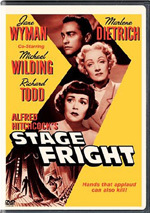 They cover Hitchcock’s interest in the material and his take on it, storyboarding, the cast and their work, the film’s visual design, locations and sets, working with Hitchcock, cinematographic techniques, music, and thematic issues. Quite a lot of good information pops up here, much of it from Sylbert. He gives us a nice perspective as one who worked with Hitchcock on the film. We find many solid insights into the production and its place within the Hitchcock pantheon, all of which make “Guilt” a solid featurette. Occasionally The Wrong Man manages to turn into something reasonably special, as it presents an unusual perspective for many segments. However, it tries to pack in too many story elements and doesn’t blend them well. That makes it awkward and stilted at times and leaves us with a film that only sporadically becomes satisfying. The DVD offers generally average picture and audio plus a good featurette. I’d recommend this as a rental for Hitchcock fans, but it’s not one of his best works.